The Tableau functions in this reference are organized by category. Click a category to browse its functions. Or press Ctrl+F (Command-F on a Mac) to open a search box that you can use to search the page for a specific function. The second example returns the absolute value for all the numbers contained in the Budget Variance field. Returns the arc cosine of the given number. The result is in radians. Returns the arc sine of a given number. The result is in radians. Returns the arc tangent of a given number. The result is in radians. Returns the arc tangent of two given numbers (x and y). The result is in radians. Rounds a number to the nearest integer of equal or greater value. Returns the cosine of an angle. Specify the angle in radians. Returns the cotangent of an angle. Specify the angle in radians. Converts a given number in radians to degrees. Returns the integer part of a division operation, in which integer1 is divided by integer2. Returns e raised to the power of the given number. Rounds a number to the nearest integer of equal or lesser value. Maps an x, y coordinate to the x-coordinate of the nearest hexagonal bin. The bins have side length 1, so the inputs may need to be scaled appropriately. HEXBINX and HEXBINY are binning and plotting functions for hexagonal bins. Hexagonal bins are an efficient and elegant option for visualizing data in an x/y plane such as a map. Because the bins are hexagonal, each bin closely approximates a circle and minimizes variation in the distance from the data point to the center of the bin. This makes the clustering both more accurate and informative. Maps an x, y coordinate to the y-coordinate of the nearest hexagonal bin. The bins have side length 1, so the inputs may need to be scaled appropriately. Returns the natural logarithm of a number. Returns Null if number is less than or equal to 0. Returns the logarithm of a number for the given base. If the base value is omitted, base 10 is used. Returns the maximum of the two arguments, which must be of the same type. Returns Null if either argument is Null. MAX can also be applied to a single field in an aggregate calculation. Returns the minimum of the two arguments, which must be of the same type. Returns Null if either argument is Null. MIN can also be applied to a single field in an aggregate calculation. Returns the numeric constant pi: 3.14159. Raises the number to the specified power. Converts the given number from degrees to radians. Rounds numbers to a specified number of digits. The decimals argument specifies how many decimal points of precision to include in the final result. If decimals is omitted, number is rounded to the nearest integer. Some databases, such as SQL Server, allow specification of a negative length, where -1 rounds number to 10's, -2 rounds to 100's, and so on. This is not true of all databases. For example, it is not true of Excel or Access. Returns the sign of a number: The possible return values are -1 if the number is negative, 0 if the number is zero, or 1 if the number is positive. Returns the sine of an angle. Specify the angle in radians. Returns the tangent of an angle. Specify the angle in radians..
Returns the expression if it is not null, otherwise returns zero. Use this function to use zero values instead of null values. Returns the ASCII code for the first character of string. Returns the character encoded by the ASCII code number. Returns true if the given string contains the specified substring. Returns true if the given string ends with the specified substring. Trailing white spaces are ignored. Returns the index position of substring in string, or 0 if the substring isn't found. If the optional argument start is added, the function ignores any instances of substring that appear before the index position start. The first character in the string is position 1. Returns the position of the nth occurrence of substring within the specified string, where n is defined by the occurrence argument. Note: FINDNTH is not available for all data sources. Returns the left-most number of characters in the string. Returns string, with all characters lowercase. Returns the string with any leading spaces removed. LTRIM(" Matador ") = "Matador "
Returns the maximum of a and b (which must be of the same type). This function is usually used to compare numbers, but also works on strings. With strings, MAX finds the value that is highest in the sort sequence defined by the database for that column. It returns Null if either argument is Null. Returns the string starting at index position start. The first character in the string is position 1. If the optional argument length is added, the returned string includes only that number of characters. Returns the minimum of a and b (which must be of the same type). This function is usually used to compare numbers, but also works on strings. With strings, MIN finds the value that is lowest in the sort sequence. It returns Null if either argument is Null. Searches string for substring and replaces it with replacement. If substring is not found, the string is not changed. REPLACE("Version8.5", "8.5", "9.0") = "Version9.0"
Returns the right-most number of characters in string. Returns string with any trailing spaces removed. RTRIM(" Calculation ") = " Calculation"
Returns a string that is composed of the specified number of repeated spaces. Returns a substring from a string, using a delimiter character to divide the string into a sequence of tokens. The string is interpreted as an alternating sequence of delimiters and tokens. So for the string abc-defgh-i-jkl, where the delimiter character is ‘-‘, the tokens are abc, defgh, i, and jlk. Think of these as tokens 1 through 4. SPLIT returns the token corresponding to the token number. When the token number is positive, tokens are counted starting from the left end of the string; when the token number is negative, tokens are counted starting from the right. Note: The split and custom split commands are available for the following data sources types: Tableau data extracts, Microsoft Excel, Text File, PDF File, Salesforce, OData, Microsoft Azure Market Place, Google Analytics, Vertica, Oracle, MySQL, PostgreSQL, Teradata, Amazon Redshift, Aster Data, Google Big Query, Cloudera Hadoop Hive, Hortonworks Hive, and Microsoft SQL Server. Tableau Data Server Both Infinite Supported in version 9.0. Cloudera Hadoop Left only 10 Impala supported starting in version 2.3.0. Returns true if string starts with substring. Leading white spaces are ignored. Returns the string with leading and trailing spaces removed. TRIM(" Calculation ") = "Calculation"
Returns string, with all characters uppercase. Note: Date functions do not take account of the configured fiscal year start. See .Fiscal Dates. Returns the specified date with the specified number interval added to the specified date_part of that date. This expression adds three months to the date #2004-04-15#. Returns the difference between date1 and date2 expressed in units of date_part. The start_of_week parameter, which you can use to specify which day is to be considered the first day or the week, is optional. Possible values are 'monday', 'tuesday', etc. If it is omitted, the start of week is determined by the data source. See Date Properties for a Data Source. The first expression returns 1 because when start_of_week is 'monday', then 22 September (a Sunday) and 24 September (a Tuesday) are in different weeks. The second expression returns 0 because when start_of_week is 'sunday' then 22 September (a Sunday) and 24 September (a Tuesday) are in the same week. Returns date_part of date as a string. The start_of_week parameter, which you can use to specify which day is to be considered the first day or the week, is optional. Possible values are 'monday', 'tuesday', etc. If start_of_week is omitted, the start of week is determined by the data source. See Date Properties for a Data Source. Returns date_part of date as an integer. The start_of_week parameter, which you can use to specify which day is to be considered the first day or the week, is optional. Possible values are 'monday', 'tuesday', etc. If start_of_week is omitted, the start of week is determined by the data source. See Date Properties for a Data Source. Note: When the date_part is weekday, the start_of_week parameter is ignored. This is because Tableau relies on a fixed weekday ordering to apply offsets. Truncates the specified date to the accuracy specified by the date_part. This function returns a new date. For example, when you truncate a date that is in the middle of the month at the month level, this function returns the first day of the month. The start_of_week parameter, which you can use to specify which day is to be considered the first day or the week, is optional. Possible values are 'monday', 'tuesday', etc. If start_of_week is omitted, the start of week is determined by the data source. See Date Properties for a Data Source. Returns the day of the given date as an integer. Returns true if a given string is a valid date. Returns a date value constructed from the specified year, month, and date. Available for Tableau Data Extracts. Check for availability in other data sources. Returns a datetime that combines a date and a time. The date can be a date, datetime, or a string type. The time must be a datetime. 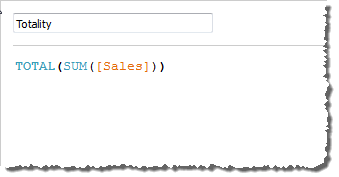 Note: This function is available only for MySQL-compatible connections (which for Tableau are MySQL and Amazon Aurora). Returns a date value constructed from the specified hour, minute, and second. Usually applied to numbers but also works on dates. Returns the maximum of a and b (a and b must be of the same type). Returns Null if either argument is Null. Usually applied to numbers but also works on dates. Returns the minimum of a and b (a and b must be of the same type). Returns Null if either argument is Null. For a live, unpublished connection, NOW returns the data source server time. For a live, published connection, NOW returns the data source server time. For an unpublished extract, NOW returns the local system time. For a published extract, NOW returns the local time of the Tableau Server Data Engine. When there are multiple worker machines indifferent time zones, this can produce inconsistent results. Returns the year of the given date as an integer. Performs a logical conjunction on two expressions. IF (ATTR([Market]) = "Africa" AND SUM([Sales]) > [Emerging Threshold] )THEN "Well Performing"
Performs logical tests and returns appropriate values. The CASE function evaluates expression, compares it to a sequence of values, value1, value2, etc., and returns a result. When a value that matches expression is encountered, CASE returns the corresponding return value. If no match is found, the default return expression is used. If there is no default return and no values match, then Null is returned. CASE is often easier to use than IIF or IF THEN ELSE. Typically, you use an IF function to perform a sequence of arbitrary tests, and you use a CASE function to search for a match to an expression. But a CASE function can always be rewritten as an IF function , although the CASE function will generally be more concise. Many times you can use a group to get the same results as a complicated case function. Tests a series of expressions returning the <then> value for the first true <expr>. Tests a series of expressions returning the <then> value for the first true <expr>. Must be placed at the end of an expression. Returns <expr1> if it is not null, otherwise returns <expr2>. Checks whether a condition is met, and returns one value if TRUE, another value if FALSE, and an optional third value or NULL if unknown. Returns true if the expression does not contain valid data (Null). Returns the maximum of a single expression across all records or the maximum of two expressions for each record. Returns the minimum of an expression across all records or the minimum of two expressions for each record. Performs logical negation on an expression. Performs a logical disjunction on two expressions. Finds the first <value> that matches <expr> and returns the corresponding <return>. Returns <expression> if it is not null, otherwise returns zero. Aggregations and floating-point arithmetic: The results of some aggregations may not always be exactly as expected. For example, you may find that the Sum function returns a value such as -1.42e-14 for a column of numbers that you know should sum to exactly 0. This happens because the Institute of Electrical and Electronics Engineers (IEEE) 754 floating-point standard requires that numbers be stored in binary format, which means that numbers are sometimes rounded at extremely fine levels of precision. You can eliminate this potential distraction by using the ROUND function (see Number Functions) or by formatting the number to show fewer decimal places. Returns the value of the expression if it has a single value for all rows. Otherwise returns an asterisk. Null values are ignored. Returns the average of all the values in the expression. AVG can be used with numeric fields only. Null values are ignored. An aggregate calculation that combines the values in the argument field. Null values are ignored. Note: The COLLECT function can only be used with spatial fields. Returns the Pearson correlation coefficient of two expressions. The Pearson correlation measures the linear relationship between two variables. Results range from -1 to +1 inclusive, where 1 denotes an exact positive linear relationship, as when a positive change in one variable implies a positive change of corresponding magnitude in the other, 0 denotes no linear relationship between the variance, and −1 is an exact negative relationship. For other data sources, consider either extracting the data or using WINDOW_CORR. See Table Calculation Functions. Note: The square of a CORR result is equivalent to the R-Squared value for a linear trend line model. See Trend Line Model Terms. With a level of detail expression, the correlation is run over all rows. If you used a formula like CORR(Sales, Profit) (without the surrounding brackets to make it a level of detail expression), the view would show the correlation of each individual point in the scatter plot with each other point, which is undefined. Returns the number of items in a group. Null values are not counted. Returns the number of distinct items in a group. Null values are not counted. 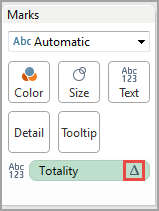 This function is not available in the following cases: workbooks created before Tableau Desktop 8.2 that use Microsoft Excel or text file data sources, workbooks that use the legacy connection, and workbooks that use Microsoft Access data sources. Extract your data into an extract file to use this function. See Extract Your Data. Returns the sample covariance of two expressions. Covariance quantifies how two variables change together. A positive covariance indicates that the variables tend to move in the same direction, as when larger values of one variable tend to correspond to larger values of the other variable, on average. Sample covariance uses the number of non-null data points n - 1 to normalize the covariance calculation, rather than n, which is used by the population covariance (available with the COVARP function). Sample covariance is the appropriate choice when the data is a random sample that is being used to estimate the covariance for a larger population. For other data sources, consider either extracting the data or using WINDOW_COVAR. See Table Calculation Functions. If expression1 and expression2 are the same—for example, COVAR([profit], [profit])—COVAR returns a value that indicates how widely values are distributed. Note: The value of COVAR(X, X) is equivalent to the value of VAR(X) and also to the value of STDEV(X)^2. The following formula returns the sample covariance of Sales and Profit. Returns the population covariance of two expressions. Covariance quantifies how two variables change together. A positive covariance indicates that the variables tend to move in the same direction, as when larger values of one variable tend to correspond to larger values of the other variable, on average. Population covariance is sample covariance multiplied by (n-1)/n, where n is the total number of non-null data points. Population covariance is the appropriate choice when there is data available for all items of interest as opposed to when there is only a random subset of items, in which case sample covariance (with the COVAR function) is appropriate. For other data sources, consider either extracting the data or using WINDOW_COVARP. See Table Calculation Functions. If expression1 and expression2 are the same—for example, COVARP([profit], [profit])—COVARP returns a value that indicates how widely values are distributed. Note: The value of COVARP(X, X) is equivalent to the value of VARP(X) and also to the value of STDEVP(X)^2. The following formula returns the population covariance of Sales and Profit. Returns the maximum of an expression across all records. If the expression is a string value, this function returns the last value where last is defined by alphabetical order. For other data source types, you can extract your data into an extract file to use this function. See Extract Your Data. Returns the minimum of an expression across all records. If the expression is a string value, this function returns the first value where first is defined by alphabetical order. Returns the percentile value from the given expression corresponding to the specified number. The number must be between 0 and 1 (inclusive)—for example, 0.66, and must be a numeric constant. This function is available for the following data sources. Non-legacy Microsoft Excel and Text File connections. Extracts and extract-only data source types (for example, Google Analytics, OData, or Salesforce). Sybase IQ 15.1 and later data sources. Oracle 10 and later data sources. Cloudera Hive and Hortonworks Hadoop Hive data sources. EXASolution 4.2 and later data sources. Returns the statistical standard deviation of all values in the given expression based on a sample of the population. Returns the statistical standard deviation of all values in the given expression based on a biased population. Returns the sum of all values in the expression. SUM can be used with numeric fields only. Null values are ignored. Returns the statistical variance of all values in the given expression based on a sample of the population. Returns the statistical variance of all values in the given expression on the entire population. Returns the full name for the current user. This is the Tableau Server or Tableau Online full name when the user is signed in; otherwise the local or network full name for the Tableau Desktop user. If manager Dave Hallsten is signed in, this example returns True only if the Manager field in the view contained Dave Hallsten. When used as a filter, this calculated field can be used to create a user filter that only shows data that is relevant to the person signed in to the server. Returns true if the current user's full name matches the specified full name, or false if it does not match. This function uses the Tableau Server or Online full name when the user is signed in; otherwise it uses the local or network full name for the Tableau Desktop user. This example returns true if Dave Hallsten is the current user, otherwise it returns false. Returns true if the person currently using Tableau is a member of a group that matches the given string. If the person currently using Tableau is signed in, the group membership is determined by groups on Tableau Server or Tableau Online. If the person is not signed in, this function returns false. Returns true if the current user's username matches the specified username, or false if it does not match. This function uses the Tableau Server or Online username when the user is signed in; otherwise it uses the local or network username for the Tableau Desktop user. This example returns true if dhallsten is the current user; otherwise it returns false. Note: "All Users" will always return as true. Returns the domain for the current user when the user is signed on to Tableau Server. Returns the Windows domain if the Tableau Desktop user is on a domain. Otherwise this function returns a null string. Returns the username for the current user. This is the Tableau Server or Tableau Online username when the user is signed in; otherwise it is the local or network username for the Tableau Desktop user. If the manager dhallsten was signed in, this function would only return True when the Manager field in the view is dhallsten. When used as a filter this calculated field can be used to create a user filter that only shows data that is relevant to the person signed in to the server. Returns the number of rows from the current row to the first row in the partition. For example, the view below shows quarterly sales. When FIRST() is computed within the Date partition, the offset of the first row from the second row is -1. When the current row index is 3, FIRST() = -2. Returns the index of the current row in the partition, without any sorting with regard to value. The first row index starts at 1. 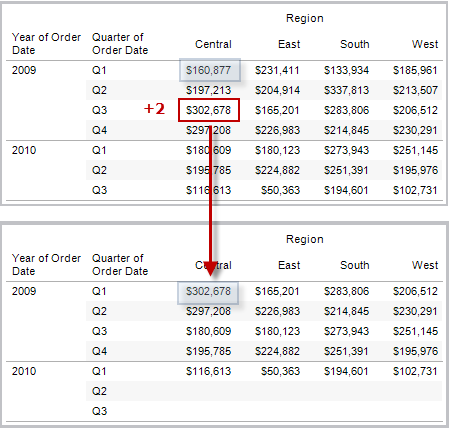 For example, the table below shows quarterly sales. When INDEX() is computed within the Date partition, the index of each row is 1, 2, 3, 4..., etc. For the third row in the partition, INDEX() = 3. Returns the number of rows from the current row to the last row in the partition. For example, the table below shows quarterly sales. When LAST() is computed within the Date partition, the offset of the last row from the second row is 5. When the current row index is 3 of 7, LAST() = 4. Returns the value of the expression in a target row, specified as a relative offset from the current row. Use FIRST() + n and LAST() - n as part of your offset definition for a target relative to the first/last rows in the partition. If offset is omitted, the row to compare to can be set on the field menu. This function returns NULL if the target row cannot be determined. The view below shows quarterly sales. When LOOKUP (SUM(Sales), 2) is computed within the Date partition, each row shows the sales value from 2 quarters into the future. LOOKUP(SUM([Profit]), FIRST()+2) computes the SUM(Profit) in the third row of the partition. Returns the value of this calculation in the previous row. Returns the given expression if the current row is the first row of the partition. SUM([Profit]) * PREVIOUS_VALUE(1) computes the running product of SUM(Profit). Returns the standard competition rank for the current row in the partition. Identical values are assigned an identical rank. Use the optional 'asc' | 'desc' argument to specify ascending or descending order. The default is descending. With this function, the set of values (6, 9, 9, 14) would be ranked (4, 2, 2, 1). Nulls are ignored in ranking functions. They are not numbered and they do not count against the total number of records in percentile rank calculations. For information on different ranking options, see Rank calculation. The following image shows the effect of the various ranking functions (RANK, RANK_DENSE, RANK_MODIFIED, RANK_PERCENTILE, and RANK_UNIQUE) on a set of values. The data set contains information on 14 students (StudentA through StudentN); the Age column shows the current age of each student (all students are between 17 and 20 years of age). The remaining columns show the effect of each rank function on the set of age values, always assuming the default order (ascending or descending) for the function. Returns the dense rank for the current row in the partition. Identical values are assigned an identical rank, but no gaps are inserted into the number sequence. Use the optional 'asc' | 'desc' argument to specify ascending or descending order. The default is descending. With this function, the set of values (6, 9, 9, 14) would be ranked (3, 2, 2, 1). Returns the modified competition rank for the current row in the partition. Identical values are assigned an identical rank. Use the optional 'asc' | 'desc' argument to specify ascending or descending order. The default is descending. With this function, the set of values (6, 9, 9, 14) would be ranked (4, 3, 3, 1). 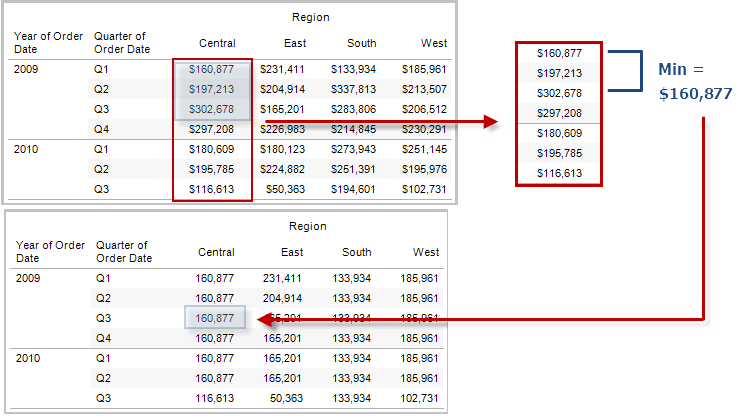 Returns the percentile rank for the current row in the partition. Use the optional 'asc' | 'desc' argument to specify ascending or descending order. The default is ascending. With this function, the set of values (6, 9, 9, 14) would be ranked (0.25, 0.75, 0.75, 1.00). Returns the unique rank for the current row in the partition. Identical values are assigned different ranks. Use the optional 'asc' | 'desc' argument to specify ascending or descending order. The default is descending. With this function, the set of values (6, 9, 9, 14) would be ranked (4, 2, 3, 1). Returns the running average of the given expression, from the first row in the partition to the current row. The view below shows quarterly sales. When RUNNING_AVG(SUM([Sales]) is computed within the Date partition, the result is a running average of the sales values for each quarter. RUNNING_AVG(SUM([Profit])) computes the running average of SUM(Profit). Returns the running count of the given expression, from the first row in the partition to the current row. RUNNING_COUNT(SUM([Profit])) computes the running count of SUM(Profit). Returns the running maximum of the given expression, from the first row in the partition to the current row. RUNNING_MAX(SUM([Profit])) computes the running maximum of SUM(Profit). Returns the running minimum of the given expression, from the first row in the partition to the current row. RUNNING_MIN(SUM([Profit])) computes the running minimum of SUM(Profit). Returns the running sum of the given expression, from the first row in the partition to the current row. Returns the number of rows in the partition. For example, the view below shows quarterly sales. Within the Date partition, there are seven rows so the Size() of the Date partition is 7. SIZE() = 5 when the current partition contains five rows. Returns a Boolean result from the specified expression. The expression is passed directly to a running external service instance. In R expressions, use .argn (with a leading period) to reference parameters (.arg1, .arg2, etc.). In Python expressions, use _argn (with a leading underscore). The next example returns True for store IDs in Washington state, and False otherwise. This example could be the definition for a calculated field titled IsStoreInWA. Returns an integer result from the specified expression. The expression is passed directly to a running external service instance. The next example converts temperature values from Celsius to Fahrenheit. Returns a string result from the specified expression. The expression is passed directly to a running external service instance. Returns the total for the given expression in a table calculation partition. The default Compute Using value is Table (Across). The result is that Totality is summing the values across each row of your table. Thus, the value that you see across each row is the sum of the values from the original version of the table. 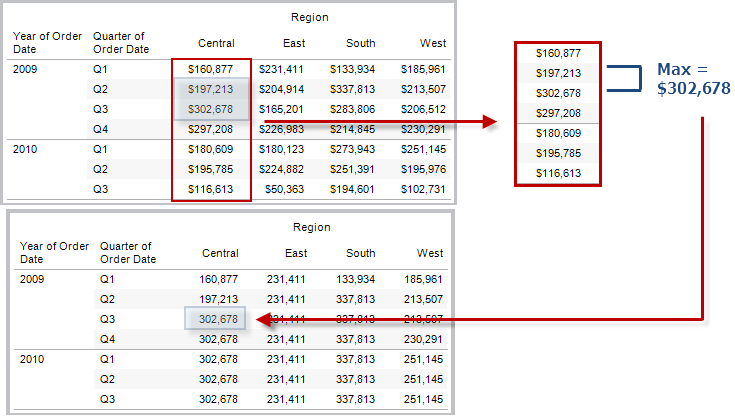 The values in the 2011/Q1 row in the original table were $8601, $6579, $44262, and $15006. 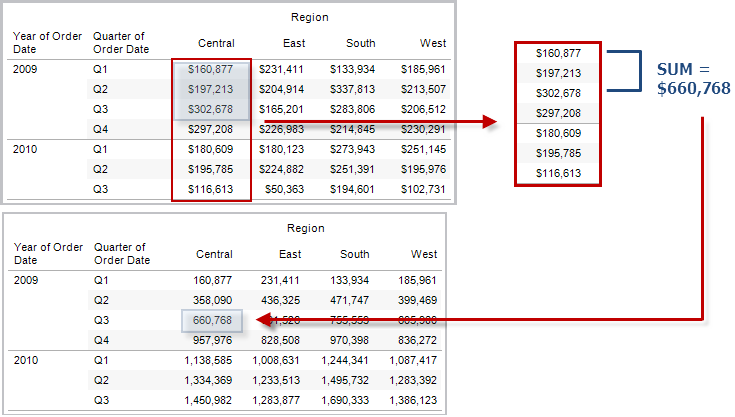 The values in the table after Totality replaces SUM(Sales) are all $74,448, which is the sum of the four original values. Returns the average of the expression within the window. The window is defined by means of offsets from the current row. Use FIRST()+n and LAST()-n for offsets from the first or last row in the partition. If the start and end are omitted, the entire partition is used. For example, the view below shows quarterly sales. A window average within the Date partition returns the average sales across all dates. WINDOW_AVG(SUM([Profit]), FIRST()+1, 0) computes the average of SUM(Profit) from the second row to the current row. Returns the Pearson correlation coefficient of two expressions within the window. The window is defined as offsets from the current row. Use FIRST()+n and LAST()-n for offsets from the first or last row in the partition. If start and end are omitted, the entire partition is used. There is an equivalent aggregation fuction: CORR. See Tableau Functions (Alphabetical). The following formula returns the Pearson correlation of SUM(Profit) and SUM(Sales) from the five previous rows to the current row. Returns the count of the expression within the window. The window is defined by means of offsets from the current row. Use FIRST()+n and LAST()-n for offsets from the first or last row in the partition. If the start and end are omitted, the entire partition is used. Returns the sample covariance of two expressions within the window. The window is defined as offsets from the current row. Use FIRST()+n and LAST()-n for offsets from the first or last row in the partition. If the start and end arguments are omitted, the window is the entire partition. Sample covariance uses the number of non-null data points n - 1 to normalize the covariance calculation, rather than n, which is used by the population covariance (with the WINDOW_COVARP function). Sample covariance is the appropriate choice when the data is a random sample that is being used to estimate the covariance for a larger population. There is an equivalent aggregation fuction: COVAR. See Tableau Functions (Alphabetical). The following formula returns the sample covariance of SUM(Profit) and SUM(Sales) from the two previous rows to the current row. Returns the population covariance of two expressions within the window. The window is defined as offsets from the current row. Use FIRST()+n and LAST()-n for offsets from the first or last row in the partition. If start and end are omitted, the entire partition is used. Population covariance is sample covariance multiplied by (n-1)/n, where n is the total number of non-null data points. Population covariance is the appropriate choice when there is data available for all items of interest as opposed to when there is only a random subset of items, in which case sample covariance (with the WINDOW_COVAR function) is appropriate. There is an equivalent aggregation fuction: COVARP. Tableau Functions (Alphabetical). The following formula returns the population covariance of SUM(Profit) and SUM(Sales) from the two previous rows to the current row. Returns the median of the expression within the window. The window is defined by means of offsets from the current row. Use FIRST()+n and LAST()-n for offsets from the first or last row in the partition. If the start and end are omitted, the entire partition is used. For example, the view below shows quarterly profit. 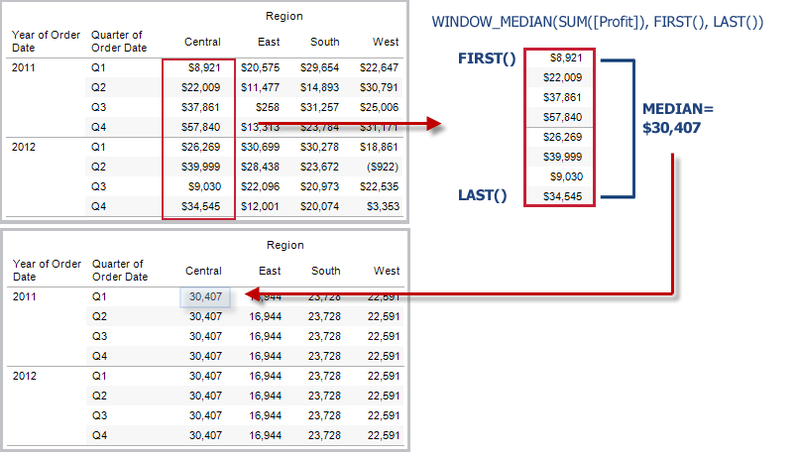 A window median within the Date partition returns the median profit across all dates. WINDOW_MEDIAN(SUM([Profit]), FIRST()+1, 0) computes the median of SUM(Profit) from the second row to the current row. Returns the maximum of the expression within the window. The window is defined by means of offsets from the current row. Use FIRST()+n and LAST()-n for offsets from the first or last row in the partition. If the start and end are omitted, the entire partition is used. For example, the view below shows quarterly sales. A window maximum within the Date partition returns the maximum sales across all dates. WINDOW_MAX(SUM([Profit]), FIRST()+1, 0) computes the maximum of SUM(Profit) from the second row to the current row. Returns the minimum of the expression within the window. The window is defined by means of offsets from the current row. Use FIRST()+n and LAST()-n for offsets from the first or last row in the partition. If the start and end are omitted, the entire partition is used. For example, the view below shows quarterly sales. A window minimum within the Date partition returns the minimum sales across all dates. WINDOW_MIN(SUM([Profit]), FIRST()+1, 0) computes the minimum of SUM(Profit) from the second row to the current row. 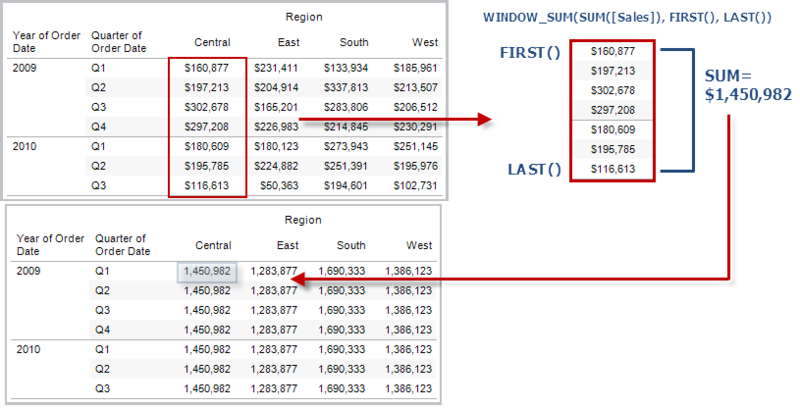 Returns the value corresponding to the specified percentile within the window. The window is defined by means of offsets from the current row. Use FIRST()+n and LAST()-n for offsets from the first or last row in the partition. If the start and end are omitted, the entire partition is used. WINDOW_PERCENTILE(SUM([Profit]), 0.75, -2, 0) returns the 75th percentile for SUM(Profit) from the two previous rows to the current row. Returns the sample standard deviation of the expression within the window. The window is defined by means of offsets from the current row. Use FIRST()+n and LAST()-n for offsets from the first or last row in the partition. If the start and end are omitted, the entire partition is used. WINDOW_STDEV(SUM([Profit]), FIRST()+1, 0) computes the standard deviation of SUM(Profit) from the second row to the current row. Returns the biased standard deviation of the expression within the window. The window is defined by means of offsets from the current row. Use FIRST()+n and LAST()-n for offsets from the first or last row in the partition. If the start and end are omitted, the entire partition is used. WINDOW_STDEVP(SUM([Profit]), FIRST()+1, 0) computes the standard deviation of SUM(Profit) from the second row to the current row. Returns the sum of the expression within the window. The window is defined by means of offsets from the current row. Use FIRST()+n and LAST()-n for offsets from the first or last row in the partition. If the start and end are omitted, the entire partition is used. For example, the view below shows quarterly sales. A window sum computed within the Date partition returns the summation of sales across all quarters. WINDOW_SUM(SUM([Profit]), FIRST()+1, 0) computes the sum of SUM(Profit) from the second row to the current row. Returns the sample variance of the expression within the window. The window is defined by means of offsets from the current row. Use FIRST()+n and LAST()-n for offsets from the first or last row in the partition. If the start and end are omitted, the entire partition is used. WINDOW_VAR((SUM([Profit])), FIRST()+1, 0) computes the variance of SUM(Profit) from the second row to the current row. Returns the biased variance of the expression within the window. The window is defined by means of offsets from the current row. Use FIRST()+n and LAST()-n for offsets from the first or last row in the partition. If the start and end are omitted, the entire partition is used. WINDOW_VARP(SUM([Profit]), FIRST()+1, 0) computes the variance of SUM(Profit) from the second row to the current row. These RAWSQL pass-through functions can be used to send SQL expressions directly to the database, without first being interpreted by Tableau. If you have custom database functions that Tableau doesn’t know about, you can use these pass-through functions to call these custom functions. 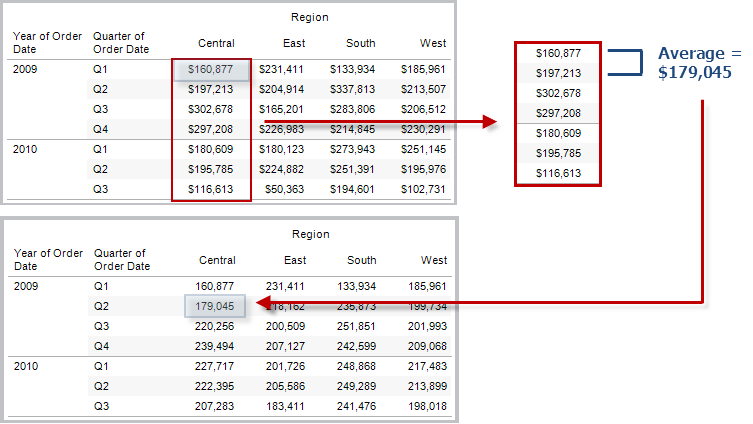 Because Tableau does not interpret the expression, you must define the aggregation. You can use the RAWSQLAGG functions described below when you are using aggregated expressions. RAWSQL pass-through functions will not work with published data sources. 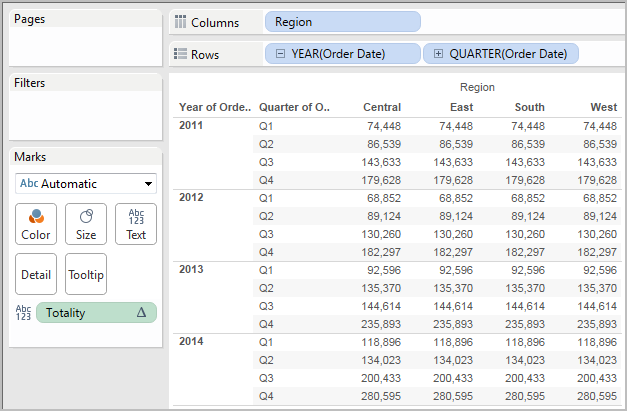 These functions may return different results starting in Tableau Desktop 8.2 than they did in earlier versions of Tableau Desktop. This is because Tableau now uses ODBC for pass-through functions instead of OLE DB. ODBC truncates when returning real values as integer; OLE DB rounds when returning real values as integer. The following RAWSQL functions are available in Tableau. Returns a Boolean result from a given SQL expression. The SQL expression is passed directly to the underlying database. Use %n in the SQL expression as a substitution syntax for database values. In the example, %1 is equal to [Sales] and %2 is equal to [Profit]. Returns a Date result from a given SQL expression. The SQL expression is passed directly to the underlying database. Use %n in the SQL expression as a substitution syntax for database values. In this example, %1 is equal to [Order Date]. Returns a Date and Time result from a given SQL expression. The SQL expression is passed directly to the underlying database. Use %n in the SQL expression as a substitution syntax for database values. In this example, %1 is equal to [Delivery Date]. Returns an integer result from a given SQL expression. The SQL expression is passed directly to the underlying database. Use %n in the SQL expression as a substitution syntax for database values. In this example, %1 is equal to [Sales]. 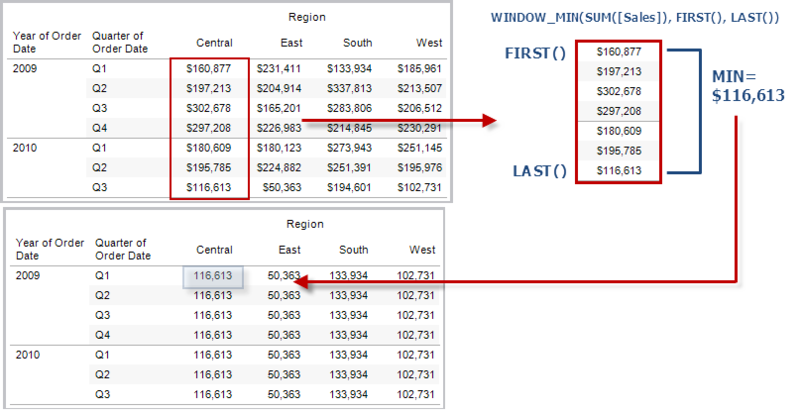 Returns a Spatial from a given SQL expression that is passed directly to the underlying data source. Use %n in the SQL expression as a substitution syntax for database values. In this example, %1 is equal to [Geometry]. Returns a string from a given SQL expression that is passed directly to the underlying database. Use %n in the SQL expression as a substitution syntax for database values. In this example, %1 is equal to [Customer Name]. 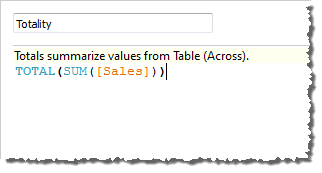 Returns a Boolean result from a given aggregate SQL expression. The SQL expression is passed directly to the underlying database. Use %n in the SQL expression as a substitution syntax for database values. Returns a Date result from a given aggregate SQL expression. The SQL expression is passed directly to the underlying database. Use %n in the SQL expression as a substitution syntax for database values. In this example, %1 is equal to [Order Date]. Returns a Date and Time result from a given aggregate SQL expression. The SQL expression is passed directly to the underlying database. Use %n in the SQL expression as a substitution syntax for database values. In this example, %1 is equal to [Delivery Date]. Returns an integer result from a given aggregate SQL expression. The SQL expression is passed directly to the underlying database. Use %n in the SQL expression as a substitution syntax for database values. In this example, %1 is equal to [Sales]. Returns a string from a given aggregate SQL expression that is passed directly to the underlying database. Use %n in the SQL expression as a substitution syntax for database values. In this example, %1 is equal to [Discount]. Returns a copy of the given string where the regular expression pattern is replaced by the replacement string. This function is available for Text File, Hadoop Hive, Google BigQuery, PostgreSQL, Tableau Data Extract, Microsoft Excel, Salesforce, Vertica, Pivotal Greenplum, Teradata (version 14.1 and above), Snowflake, and Oracle data sources. 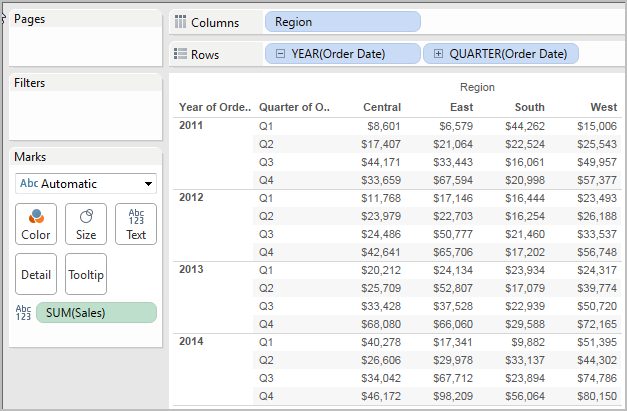 For Tableau data extracts, the pattern and the replacement must be constants. For information on regular expression syntax, see your data source's documentation. For Tableau extracts, regular expression syntax conforms to the standards of the ICU (International Components for Unicode), an open source project of mature C/C++ and Java libraries for Unicode support, software internationalization, and software globalization. See the Regular Expressions page in the online ICU User Guide. Returns true if a substring of the specified string matches the regular expression pattern. This function is available for Text File, Google BigQuery, PostgreSQL, Tableau Data Extract, Microsoft Excel, Salesforce, Vertica, Pivotal Greenplum, Teradata (version 14.1 and above), Impala 2.3.0 (through Cloudera Hadoop data sources), Snowflake, and Oracle data sources. For Tableau data extracts, the pattern must be a constant. Returns the portion of the string that matches the regular expression pattern. This function is available for Text File, Hadoop Hive, Google BigQuery, PostgreSQL, Tableau Data Extract, Microsoft Excel, Salesforce, Vertica, Pivotal Greenplum, Teradata (version 14.1 and above), Snowflake, and Oracle data sources. Returns the portion of the string that matches the regular expression pattern. The substring is matched to the nth capturing group, where n is the given index. If index is 0, the entire string is returned. This function is available for Text File, PostgreSQL, Tableau Data Extract, Microsoft Excel, Salesforce, Vertica, Pivotal Greenplum, Teradata (version 14.1 and above), and Oracle data sources. Note: Only the PARSE_URL and PARSE_URL_QUERY functions are available for Cloudera Impala data sources. Returns the JSON object within the JSON string based on the JSON path. Returns a component of the given URL string where the component is defined by url_part. Valid url_part values include: 'HOST', 'PATH', 'QUERY', 'REF', 'PROTOCOL', 'AUTHORITY', 'FILE' and 'USERINFO'. Returns the value of the specified query parameter in the given URL string. The query parameter is defined by the key. Returns true if the XPath expression matches a node or evaluates to true. Returns the floating-point value of the XPath expression. Returns the numerical value of the XPath expression, or zero if the XPath expression cannot evaluate to a number. Returns the text of the first matching node. Given a URL string, returns the domain as a string. Concatenates values from each record into a single comma-delimited string. This function acts like a SUM() for strings. Given a URL string, returns the host name as a string. Returns the logarithm base 2 of a number. Returns the first string with any leading occurrence of the second string removed. Returns the first string with any trailing occurrence of the second string removed. Converts a TIMESTAMP data type to a UNIX timestamp in microseconds. Converts a UNIX timestamp in microsseconds to a TIMESTAMP data type. Given a URL string, returns the top level domain plus any country domain in the URL. Want to learn more about functions?